Seit Donnerstag-Abend, da hatte ich gerade völlig anderes im Sinn Ist jetzt online, vielen Dank. TR, machst Du News? Wieso soll er? 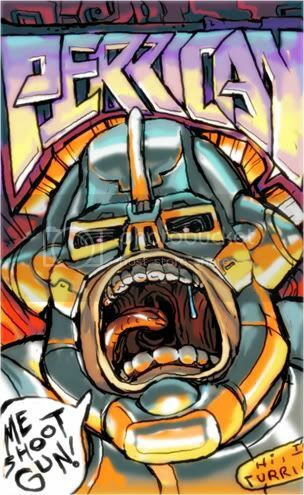 Liegen da die Rechte von Turrican? You know, perhaps they'll produce walkers now... "MAKE MY DAY...!" t.r. should read more MT-Fanpage. "FactorY" is funny. Hoppla, didn't read the news. Wow. F5 GmbH is not bankrupt. If they were, rights would fall back to the original creators. There is of course no formal definition of Turrican-like gameplay. The new music sample is cool, but the first part is *very* hot-mastered... stop to the loudness war! And since Factor 5 lcc and GmbH are insolvent, they´ll have to sell the trademark, right? If the gameplay is copyrighted, is it defined somewhere what "turrican-like" gameplay is like and who and for how long someone holds this copyright? Music sounds way nicer than the initial previews. I mean the look of the characters inc. the Turrican Assault Suite. No, there is no patented Turrican-like gameplay. But there is copyrighted Turrican-like gameplay. And the name still has different owners in different countries. 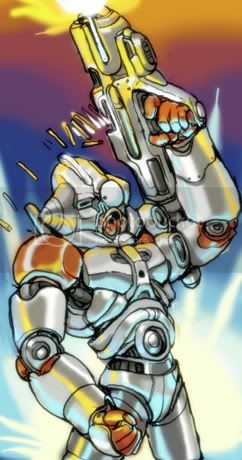 the name of the character is not that important (after all most people know "him" as turrican). for us non-german speakers is there a link or something? is it true? THE MASTER RETURNS? There's no such thing as "patented Turrican-like gameplay", it's all about the name. F5 is no more, and THQ has missed the bus - way to go for Manfred. But the combination of game mechanics is not used in many other games. Most of the games mechanics (e.g. the wheel) are used in many other games... and the artwork would be quite different if made today. Also, there is no protected Turrican-music-theme which is in all parts. @robert: what else might there be protected? It's just the rights to the name, things might be even more complicated now. Das sind doch gute Nachrichten. Jetzt brauchen wir nur noch talentierte Jungs, und es kann losgehen (Unser eigenes Turrican)! Katakis 2 -- THE RETURN OF THE MASTER!!! MT rulez!! We want more info now! You´ll get more information about Katakis 2 very soon! PROMISED!! Well, can´t spread any longer previews of the music, sorry! That anime pic is cool. Music samples sound nice as well, but a bit short. have problems with the naomi emulator makaron!my keyboard dont work (can not start the rom) anyone knows how to handle this? Schon zwei Leute, die in Physik nicht aufgepasst haben. Auf Video wirklich komisch, gespielt aber wohl völlig ok. Trotzdem mal darüber nachgedacht das Schiff zu drehen, und nicht das Universum? Ist doch kein Futurama hier! Probably an old graphics chip, which does not support textures larger than 2048x2048. In that case use3d=0 might be faster anyway. You cant change the tilesetsize smaller if you have so many animations in it. But if you do that, all invisible sprites and tiles getting visible. That is correct. But I never knew what´s the problem with T2002. The mistake comes not often, but I had this one in FF 6 years ago, too. The only way to solve the problem for us is to set the tileset to a max size of 640x1984. The problem that you cant see enemies and others has something to do with the level sizes. Pekaro programmed this, so I dont know how you can fix this. Well fine Got an appcrash in the jetpack level or just die? Second time no crash, made it past the jetpack level. Really nice to play classic levels with the Turrican 2 type weapons. It looks like that the Worldset won't be loaded sucessfully. Open the T-ALL_0 level with the leveleditor. Can you see there the level? I don't think, Gunstar Heroes feels very Turricanish. i think treasure games are the best of all games(gunstar heroes, ikaruga, radiant silvergun, gradius 5 etc. @RuvF: Where do I mail the screenshot to? second what about Gunstar heroes? very liniar, but with great bosses, fast action, and awsome weapons much like Turrican. Just a couple of points. first, you only list Super metroid, ---- now there are more 2D metroid games like fusion and zero mission shouldn't it go in as a series the way you've put in Contra and mega man? 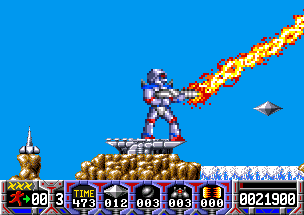 Great to see the Turrican Seta get a facelift and to see more games in the Seta. Strange... Please send a screenshoot.